A conference poster on the side of the Auditorium. The semi-annual General Conference of the Church of Jesus Christ of Latter-day Saints is over, but the triennial World Conference of Community of Christ is just now in full swing. This is the first World Conference I’ve attended, so I thought I’d blog some of my reflections. A little more parked up than normal. It’s very different to be in Independence when the Temple and the Auditorium are filled. I visit all the time between conferences when these massive buildings are sparsely peopled and the vast seas of parking lots surrounding them are mostly vacant. When I went to park midday Sunday, all the lots were filled beyond capacity (people had even parallel parked up the aisles in the lots) and street parking was filled for many blocks surrounding the Temple complex. I ended up parking 3 blocks southwest of the Auditorium parking lot. The interiors too are filled, and (happily) I find I can’t get across a hallway or room without seeing into a familiar face and stopping to catch up. 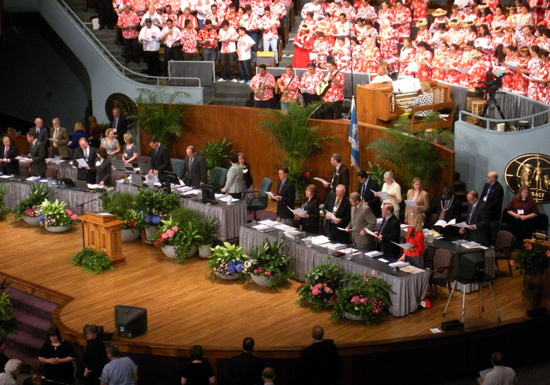 Both LDS General Conference and Community of Christ World Conference share a common origin (the general conferences of the early church 1830–44), but the two institutions have diverged significantly from the original and each other. The name “World Conference” was adopted in 1962 corresponding with a new period of international growth that began in the 1950s and continues to the present. 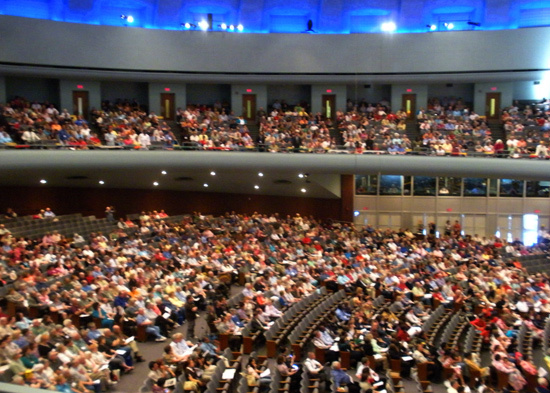 Over the years, conferences of the Reorganized Church have become less frequent. The General Conference held one hundred and fifty years ago in Amboy, Illinois, lasted four days (April 6–9). It was also a semi-annual event followed up by a second 1860 General Conference in October. However, already by 1861 the conferences became annual, and by the turn of the 20th century, they were regularly biennial. This is first year that they are triennial (the previous World Conference took place in 2007) and it’s quite possible that the event will eventually be on a 4-year cycle like the Olympics or U.S. presidential elections. Although less frequent, World Conferences are significantly longer than they once were — this conference will last eight days from last Saturday to this Saturday. Immediately prior to the conference, we held our annual Restoration Studies/Sunstone Midwest Symposium. This was the first symposium since I retired from being executive director of JWHA, so I don’t have any official numbers of attendees or anything else, but everything seemed to go swimmingly and I enjoyed all the sessions I attended. Most exciting for me was the fact that I finished a number of books, which were printed in time to debut at the symposium: Restoration Studies Vol. XI, Alexander: Joseph and Emma’s Far West Son, Mormon Graves in Kirtland, and Community of Christ: An Illustrated History. Two further titles were printed in time to debut the next day at World Conference: 150 Years of Song: Hymnody in the Reorganization, 1860–2010, and a reprint of Joseph Smith III’s memoirs. 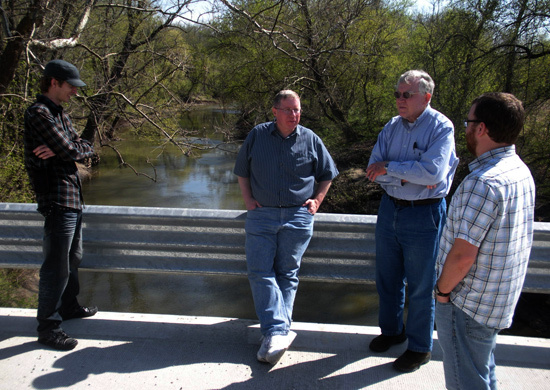 On the bridge over Crooked River, just up stream from the 1838 battle site: Mike Reed, Craig Foster, Newell Bringhurst, and Seth Bryant. I spent the day Saturday driving around Ray and Clay counties with Newell Bringhurst, Craig Foster, Mike Reed, and Seth Bryant, visiting such sites as the Three Witnesses Monument (including Oliver Cowdery’s grave) at a pioneer cemetery where at least one of my family members (Alonzo Winchester) is presumed buried, David Whitmer’s grave on the other side of town, and the Crooked River battle site. The last is out in the countryside of Ray County near the Caldwell border (Caldwell was formerly the Mormon county and was the site of church HQ in 1838). Other than farms and houses, the nearest building to the site today is a white identity church decorated with Anglo-Israelite symbols and flying the confederate flag. The brand new bridge (pictured) is already vandalized with racist, neo-Nazi graffiti, so the area doesn’t seem to have progressed much since the 1838 Mormon War period. We made it back to Jackson County safely and attended the opening session of World Conference on Saturday night. The main sessions are held in the Auditorium, a vast meeting space begun in the 1920s which dwarfed the Salt Lake Tabernacle but is today dwarfed by the new LDS Conference Center. I sat in the balcony next to Newell and Craig; this was their first World Conference as well. The session opened singing the familiar hymn “Redeemer of Israel” — the LDS melody is slightly changed from the original — but the familiarity nearly ended there. 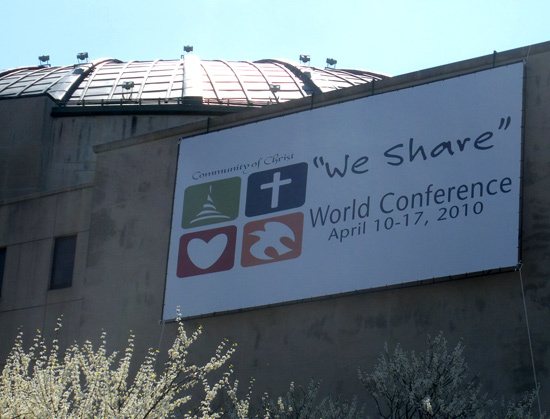 World Conference is an actual business conference of the church, operated under parliamentary rules. A portion of the Auditorium on Saturday night. The floor is reserved for delegates; many of the empty seats are from elected delegates from around the world who were denied visas. 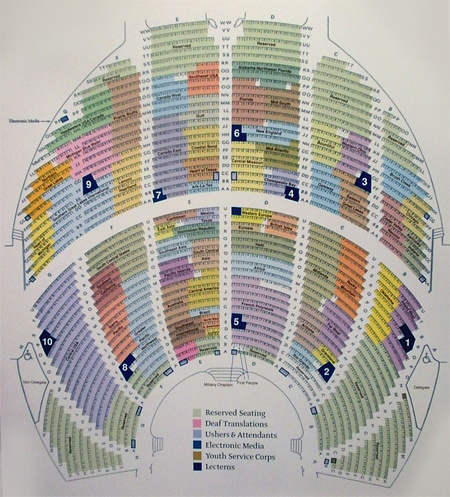 A diagram showing where the delegations are seated in the Auditorium, organized by Mission Center. For example, the purple color around the number 5 is the French Polynesia Mission Center, the blue behind that is the Africa Mission Center, the green behind that is the Haiti Mission Center, and so forth. 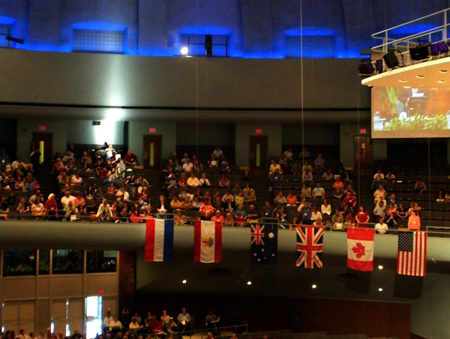 The main floor is reserved for delegates elected by Mission Centers around the world. The opening night’s business was to elect officers to preside over the conference (it was moved, seconded, and carried that the First Presidency be elected to preside) and to vote to approved the general parliamentary rules and schedule for the conference. In places this became tedious, especially when the emergency evacuation procedures were read and when several changes in the published schedule were announced. Among the striking events of the first session was an extended flag ceremony, in which members from around the world unveiled flags in an order based on the establishment of Community of Christ churches in each of those nations. (Flags and symbols were also displayed to honor indigenous peoples and peoples without national recognition.) The relative order was interesting, relying on quirks of history that brought missionaries some places earlier than others — for example, while French Polynesia and Haiti were near the front of the list, France itself was at the end. We sat behind the young women clad in traditional dress who unfurled the Russian Federation flag. As recent as Russian participation in the church has been, it has nevertheless been very apparent. No less than four of the guides I saw at Kirtland and Nauvoo last summer were from Russia. Tables for the General Officers on the rostrum. Behind them, the French Polynesian delegation formed a choir Saturday night. 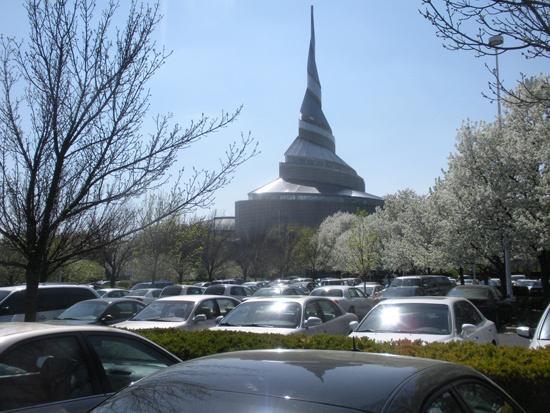 The church also debuted a new promotional video highlighting its “Enduring Principles” — I like the fact that the video was framed around the symbol of the upward spiral, which has become almost a logo for Community of Christ since the dedication of the Temple in 1994. The first mass meeting of the Elders in the Temple’s inner sanctuary. Sunday included a massive communion (sacrament) service and ended with President Veazey’s address, in which he made his case for the canonization of his latest prophetic counsel. If accepted, this historic revelation will become Doctrine and Covenants Section 164 (more on this later). Meanwhile, the business of the conference began. On Sunday I snuck into the “mass meeting” of Elders with Ron Romig and David Howlett. This business meeting was held in the Temple’s inner sanctuary and its agenda was reviewing (and approving or rejecting) proposed leadership changes. Two apostles and the presiding evangelist (patriarch) are retiring and the elders were considering their proposed replacements. Motions and seconds were made to consider and discuss each individually. Many elders went forward to speak on behalf of each of the candidates and no one spoke against any. I asked Ron and he said he had remembered people voicing contrary opinions against candidates at previous conferences, as recently as 2007 or 2005, but he didn’t say against whom. The voting was mostly but not entirely unanimous. I also spent time Sunday in the basement of the Auditorium where the many church auxiliaries have set up booths, almost like a convention or trade show. I got lots of swag, including pens and pads from Outreach International, buttons from GALA, book marks from the Community of Christ Historic Sites Foundation, and the like. I also attended an open house for Outreach International — the church’s humanitarian auxiliary — where I got some snacks and visited my friend Matt Bolton, who was doing a book signing. All in all a pretty action-packed conference so far, and the big, historic (and possibly cantankerous) events are still to come. I’ll keep you posted! This is SO cool, John. Thanks so much. Your last paragraph is an understatement indeed, if I understand the situation correctly. Looking forward to your continued reports. Awesome. I really need to look up the Community of Christ congregation here in Kentucky, so I can attend a service. I have always wanted to visit and feel what it’s like. Well written and quite interesting. Thanks for your work. Goodness, John. Your first world conference and already sneaking in to the EQ meeting. For penance, you’ll probably be required to read and understand the entire budget report come midweek. Welcome to the Wonderful World of World Conference. It’s so interesting to hear what our brothers and sisters are doing. I love this post, John- and look forward to more. There is a CofC church just a mile or two from me, and I’ve thought about dropping in, but haven’t been sure mere curiosity is respectful enough to attend another’s services. Incidentally, they do seem to have a large Russian component to their congregation, since their weekly sign is posted in Russian and English. Looking forward to hearing about the (possibly cantakerous) big events, as I believe I know what you are talking about. Fingers crossed! Do what is right, let the consequence follow. Wow, look at all of the gals in the Elders meeting. Tracy M — I’ve been reluctant to attend different services: we weren’t sure what to expect the first time we went to church with the Strangites or the Bickertonites. Truth be known, we were pretty nervous going to an LDS service since Mike had never been and I hadn’t been 15 years or so. But folks in our local student ward and, indeed, everybody we’ve visited have been extremely welcoming and now I’m planning to attend an AUB service this summer. 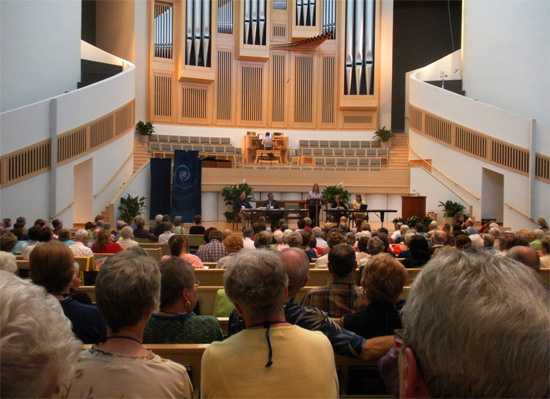 Meanwhile, as I’ve been at World Conference, Mike is back in Ann Arbor and he decided (out of the blue) to visit the Episcopalians for the first time to see what that was like. Tracy, I suppose you could ask yourself, how would I feel if someone from another church wanted to visit my ward out of mere curiosity? I’m guessing you wouldn’t find that disrespectful. My own experience with the CofC (a congregation in Mesa, AZ) was that it was interesting, different, similar, better, and worse than my LDS experience, all at the same time. Downsides were that it was really small and almost totally seniors (only two families with children in the whole place). Upsides included a fantastic Sunday School (sort of like a Sunstone presentation) and it was super cool to see women officiating and conducting. The actual service was only 1 hour (Sunday School optional). The talks and singing were subdued-reverent, similar to LDS style. John, a really great post and a great perspective to share. However, as a former Community of Christ appointee in the Far West Stake, I should state the obvious that there are some good citizens of Ray County, but the neo-confederate stuff is very troublesome. Todd (#11): Sorry, I certainly didn’t mean to condemn all of Ray County — just the immediate vicinity of the Crooked River battle site where the graffiti was pretty shocking. I used to live in Kearney (claim to fame: Jesse James’ birthplace–they hold a festival every year for their hero), just outside of Liberty Missouri. The kids at the high school I attended were all very proud that our town was the Missouri headquarters of the KKK, supposedly that is, I never wanted to find out if it was true or not. The local Baptist church every year passed out a 400 page book “How to Save your Friend from Mormonism” to all their youth groups…there was grand total of 30 Mormon kids in town from kindergarten to 12th grade out of roughly 2500 students. More than once I was asked where my horns were or heard threats about how they ran us out of the state once, they should do it again. Can’t say that I ever regretted leaving that town. Very interesting to get this “insider” report. Thanks John. Oh definitely go, Tracy. Of course they would delighted to welcome a curious, respectful visitor exactly the way your ward would if one of them came to Sacrament Meeting. Be careful, though, you might like it and wind up joining. You could hold the priesthood within a year! Thanks for this fascinating insight into what it’s like to attend a World Conference. I enjoyed this post tremendously! I can’t wait to get my hands on some of the books you mentioned, especially Joseph III’s memoirs! Has Matt written any other books? I am reading his Apostle of the Poor right now. Just a point of clarification the presiding evangelist (who is David Brock) is not retiring. Two of the Apostles are no longer going to be serving in that capacity (Mary Jacks Dynes and Leonard Young). Apart of that is that Leonard has received a new priesthood call to the office of Evangelist (but not Presiding Evangelist). Then two new individuals (Richard James and Scott Murphy) have been called to the Office of Apostle. Thank you so much for doing this. It is very interesting to see the different modes betweeen the different churches. Speaking of Russians, it is interesting to see the glasnost in the CoC. A very interesting post, John. Sad that I missed the Restoration Studies conference. This is really great, John. Looking forward to the rest. I was hoping you’d put up a report, John; thanks. I look forward to more updates. I concur with what has been said already. I am looking forward to your notes and interested to see how things turn out, and the processes involved. Dan (#18): He’s also written a book on landmine clearance: Foreign Aid and Landmine Clearance: Governance, Politics and Security in Afghanistan, Bosnia and Sudan. He’s currently working on several more books, including a collection of articles on the history of the Community of Christ around the world. Sean (#19) — Thanks very much for the correction about the presiding evangelist. I was confused there. Very cool stuff, John. Can’t wait to hear how things go today. Great pictures, as always. Great post, as always! Surely, this is better than attending in person. Do General Conference for me next time, won’t you? Finally they loaded. Thanks, John.